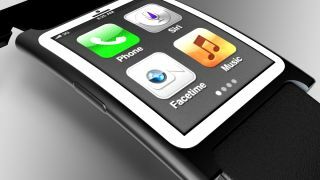 Logic would tell you Apple would unveil its long, long-rumored iWatch next to the iPhone 6, and it turns out logic is probably right. According to John Paczkowski over at Recode, Apple is indeed planning to announce its first wearable on September 9. That's the date Apple has supposedly set aside for a media event for its next-gen iPhones, too. Paczkowski refers to the device as "a new wearable," so perhaps Apple is really planning on showing off the iSock ... we kid. So here's where we stand for September 9: two new iPhones (a 4.7- and 5.5-inch iPhone 6) and the iWatch. We missing anything, Apple? Like the new iPhones, the iWatch will likely make use of Apple's new HealthKit and HomeKit platforms to deliver fitness, health and control-your-toaster functions unseen from the company before. Apple is relatively late to the wearable game; Samsung and Google are just a few names already pumping out smartwatches and Glasses of every shape and size. That being said, Apple has a history of being a latecomer in the name of getting a product right. Such could be the case with the iWatch.